What really gets me about true historical pirates is the clichés. Unlike the clichés set forth by the Wicked Witch of the West – who really didn’t look or act much like real witches at all – pirate clichés do have many roots in truth. Some of the most famous pirates such as Blackbeard, Morgan, and Bellamy demostrated many of the qualities one expects from pirates – including the swilling of rum, the terrorizing of locals, and the wearing of tricornered hats. But it’s these same common features that make each pirate’s unique departures from the cliché stand out all the more. Black Bart Roberts was an amazing contrast between the cliché and the unique. Having served as a merchant sailor, he in many ways shared roots with many a pirate – stuck in a dead-end, dangerous and underpaid profession, engaging in the regretable business of human trafficking, and eventually falling victim to a pirate raid. Coerced to join the crew, it wasn’t long before he decided that if pirate was what fate had chosen for him, he would embrace it – and soon he discovered that he had quite the affinity for this illicit profession. Black Bart rose quickly through the pirate ranks – all the while drinking tea and refraining from all the other forms of carousing one expects from a successful (or any) pirate. Sharing little in common with all other successful pirates, he nonetheless became one of the most successful of his day. And though a reluctant pirate at first, he was also an unapologetic one with no Letter of Marque to hide behind, nor even mixed loyalties preventing him from raiding his own countrymen. Roberts was a pirate – albeit a relatively nice, sober pirate. 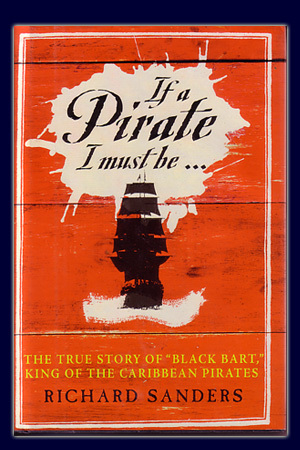 “If A Pirate I Must Be…” is an enjoyable, detailed read. It manages to draw the facts into a compelling narrative, and avoids the pitfalls of getting too academic or bogged down by nitty-gritty. 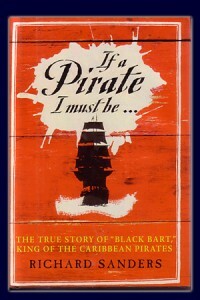 Roberts himself comes across as one of the most decent pirates imaginable, nicely encompasing the noble aspects of this romanticized trade, making this an excellent book for those wanting to read up on some history, but wishing to steer clear of all the “mythbusting” books intent on telling us how awful pirates really were. There’s two sides to that argument. Both are true, but the Roberts side of the coin is certainly the more fun. This entry was posted in Books and tagged black bart, history, non-fiction, sanders by Bilgemunky. Bookmark the permalink.